Through my years of experience, I’ve learned that many people have “over-worked” or “over-exposed” skin, causing conditions that can worsen over time. 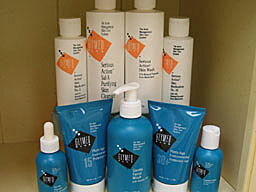 Skin conditions, such as acne and overly sensitive skin, can actually be caused by using the wrong products. Allow me to recommend the right skin care products to create a regimen to correct any skin condition you may have; I can help you achieve healthful and glowing skin. Jennifer Clark Skincare products are manufactured in Southern California and produced solely for an exclusive group of estheticians. This lab adheres to strict guidelines in producing a product line that addresses all major skin conditions. Whether you have dry, dehydrated, oily, or normal skin, acne or rosacea, there are specific products designed for your skin type and condition. The products contain only the most gentle and healthful plant or mineral-derived ingredients for your skin- setting them apart from animal or petroleum-based products. These products have stabilized fragile ingredients such as vitamin A and C, and antioxidant-rich plant extracts to ensure they retain their full potency. And, Jennifer Clark Skincare products have cutting-edge ingredients and technologies, such as collagen-producing peptides, for optimal, visible results. GlyMed Plus is a multi-purpose professional skin care system with a range of sophisticated formulas, incorporating glycolic, lactic, citric and salicylic acids, benzoyl peroxide and natural botanical extracts, aloe vera and anti-oxidant compounds.Originally developed for physicians, GlyMed Plus is now fast becoming the choice of the world’s best estheticians and spa professionals. The Acne Management line within GlyMed Plus contains products that will cleanse, heal inflammation, clear pores, exfoliate, fade discoloration, and protect skin from overexposure.